>> Check availability / Book now for Bettystown, Co. Meath. Bettystown, Co. Meath in sleeps 5 people. Set in landscaped gardens. 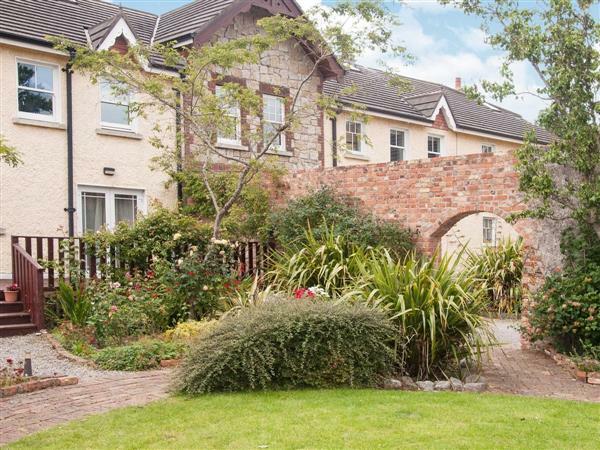 Less than an hour from Dublin, this property is in a small development of 12 houses set in beautiful landscaped gardens, some with decking, in a peaceful and tranquil location. Enjoy the 6 miles of sandy beaches which offer windsurfing and swimming. Great location for touring the sunny south east and is only 40 minutes from Dublin city. Great amenities to enjoy locally including horse racing, golf and walking. Shop 800 yards. Ground floor: Living/dining room/kitchen. First floor: 3 bedrooms: 1 double with en-suite shower room and toilet, 1 twin, 1 single. Bathroom with shower over bath and toilet. Gas central heating, bed linen and towels included. Elec (chargeable). Cot. High-chair. CD. Microwave. Washer/dryer. Dish washer. Freezer. Garden with furniture. Ample parking. Holidays at Bettystown, Co. Meath run from Saturday to Saturday. Find out more about Bettystown, Co. Meath. For a better idea of where Bettystown, Co. Meath. is, you can see Bettystown, Co. Meath. on the map below. Prices at Bettystown, Co. Meath. Towns near Bettystown, Co. Meath. = Bettystown, Co. Meath. on the map = Other cottages near Bettystown, Co. Meath. Features at Bettystown, Co. Meath. Do you want to holiday near Bettystown, Co. Meath. (W31290), you can see other cottages within 25 miles of Bettystown, Co. Meath. ; have a look to find your perfect holiday location. These cottages are all within 25 miles of Bettystown, Co. Meath. No lodges are within 30 miles of Bettystown, Co. Meath. Prices and availability at Bettystown, Co. Meath.